I rode Tuesday thinking I wouldn't be able to ride Wednesday prior to the CT NEMBA monthly chapter meeting in Middletown, only to find that my afternoon suddenly freed up so I popped smoke, swung by the house to pick up my bike and drive north! I hate having to stop by the house on my way to a ride to pick stuff up because the kids automatically think Daddy's home to play and feel so bad that I will be leaving again. I will make it up to them tonight, thought. My darling wife did hook me up and brave the desolate wasteland that is my home office and charge up the battery on my camera for me! Thanks Dear! The other day I went to the doctor because I thought a past leg injury of mine had resurfaced after snowboarding two weeks ago but I got it all checked out Tuesday and it appears that I might have pulled a few muscles or even pinched a nerve somewhere. The doctor said to take it easy so that is why I rode the 'Horse yesterday and I was planning on riding it again on Wednesday but when I pulled it down from the rack, the back tire was flat! That is the last time I am riding that bike at Dingle Brook! So, I went with the single speed. It was a nice little turn out for an impromptu ride before the Chapter Meeting. Barry Burke and his friend Bill (rides a blue Raleigh XXIX rigid), Paula, Glenn, and myself. We rode about four and half miles in the waning daylight. 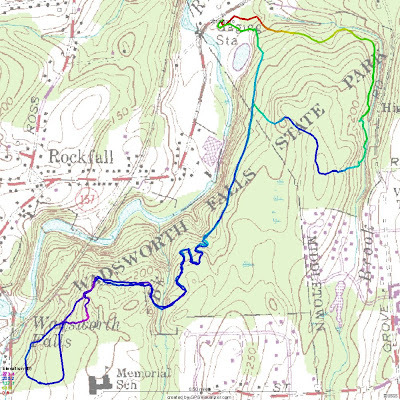 The trails at Wadsworth Falls State Park are fantastic for a fun ride with variable terrain. There is no insane climbing or and for that matter nothing terribly technical, either. So if you are just starting out, I would highly recommend to everyone to try this place! Surprisingly, there was not one mechanical during the entire ride! That is atypical for a CT NEMBA ride. This house at the edge of the park got our attention. It looked like a Mexican Restaurant. It would have been nice for a little mid-ride pick me up with a cold Corona and few tacos. There was, however, a casualty, myself. I tried to bunny hop over a log that was on an angle and got stuck between my front wheel and bash guard, didn't unclip in time and my thigh and forearm bared the brunt of my weight on the log. Needless to say, I got a nice bump on my leg and arm but it didn't hinder my ability to ride.